1951 - 2011: 60 YEARS!! WHERE DID THE TIME GO? Apologies to those visitor to this website who left comments that have gone unanswered. 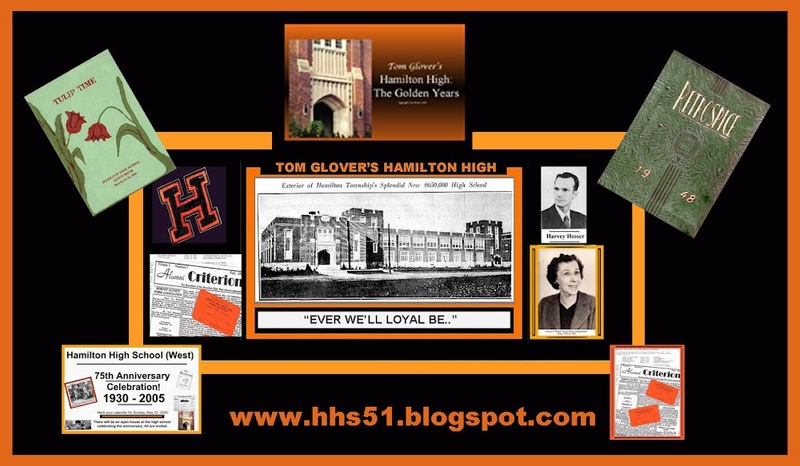 I discontinued posting on my Hamilton High and Kuser School sites due to my inability to keep all three sites going simultaneously. That was a mistake, and I am hereby resuming posting. To those of you who didn't receive a response to comments left on the site, please know that it was unintentional. A bit of simple math, 2011 minus 1951 equals 60 years, and at the golden age of 78, I admit that I let up a bit on the accelerator. However, I have decided to resume posting on this website. 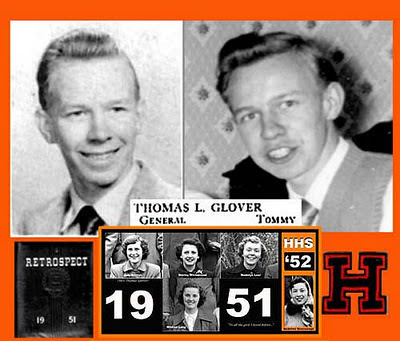 As to the goals of this endeavor and even though I have a very soft spot in my heart for my HHS '51 classmates, you will see that www.hhs51.blogspot.com is a chronological history of Hamilton High School West (Watson) which in my biased opinion is the best high school in the state of New Jersey. I would like to make a suggestion to those visitors who are familiar with tweaking your computer. This site is much more legible if you reset your monitor display to 800 x 600 (from 1024 x 768). 800 x 600 is much more comfortable for those of us who advancing age has resulted in our being "optically challenged." 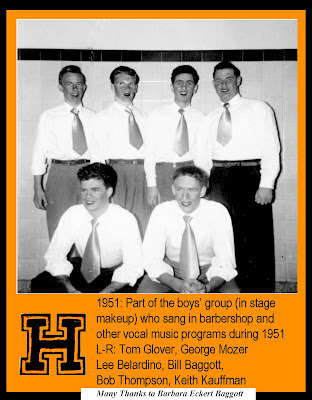 1951: WE MADE SUCH BEAUTIFUL MUSIC TOGETHER! Those were such wonderful years! As I pile on the years, memories of those years of singing with the gentlemen above will remain until we prayerfully meet again in the great beyond to resume our vocal talents. The photo was taken while we were in stage makeup as you can see by the lipstick and the flesh-colored make up we wore as we performed for the public. (don't miss our lily white necks where the makeup begins!) Each of us had a specific talent. Our "anchor," Bill Baggott along with Lee Belardino handled the tenor section. Keith Kauffman and Bob Thompson handled the deep, deep, "bass II" and George Mozer and I took over the baritone ("bass I") section. I will never forget the beautiful, indeed ethereal harmony we made together as we sang those great old "barbershop" songs; "When You Wore a Tulip," "Drifting and Dreaming," "In the Evening By the Moonlight," "Shine on Harvest Moon," and countless others.